nce upon a time there was a tsar named Berendey, who had three sons. The tsar's palace was surrounded by a beautiful orchard, and among the trees in the orchard was a wonderful apple-tree which bore golden apples. One day the tsar discovered that someone was getting into the orchard and stealing his golden apples. 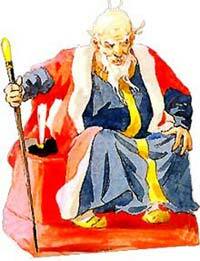 He was furious, and sent his guards to catch the thief. But though they watched all night they were quite unsuccessful. The tsar was so upset at the loss of his golden apples that he lost his appetite too. His sons tried to comfort him, and the eldest told him: "I will go and guard the orchard against the thief tonight, father." "Well, have you good news for me? Did you see the thief?" "No, father," his son answered. "I did not sleep a wink all night, I did not even close my eyes. But I saw no one." The following night the tsar's second son went to guard the orchard. But he, too, slept all night, and next morning he told his father he, too, had seen no sign of a thief, although he had not closed his eyes. Now it was the turn of the youngest brother, Prince Ivan, to guard the orchard. And he was so anxious not to miss the thief that he was afraid even to sit down, let alone to lie down. When he felt he was getting drowsy he washed his face with dew, and this made him wide-awake again. About halfway through the night he thought he saw a light in the orchard. It grew brighter and brighter, until all the trees were lit up. Then he saw that the light was coming from a Firebird, which was sitting on the apple-tree and pecking at the golden apples. So he crept up very quietly to the tree and caught hold of the bird by the tail. But the Firebird spread its wings and flew away, leaving only one tail feather in Prince Ivan's hand. "Well, Ivan, did you see the thief?" "Dear father," Ivan answered, "I cannot say I caught him, but I have found out who is eating our apples. And I have brought you a tail feather in proof. It is the Firebird." "My dear children, I want you to saddle good horses and ride forth into the world to see whether you can find and bring back the Firebird." The young men bowed to their father, saddled good horses, and set out on their travels: the eldest in one direction, the second son in another, and Prince Ivan in a third direction. He rode near and far, high and low, along by-paths and by-ways - for speedily a tale is spun, but with less speed a deed is done - until he came to a wide, open field, a green meadow. And there in the field stood a pillar, and on the pillar these words were written: "Whosoever goes from this pillar on the road straight before him will be cold and hungry. "Whosoever goes to the right side will be safe and sound, but his horse will be killed. And whosoever goes to the left side will be killed himself, but his horse will be safe and sound." Prince Ivan read this inscription and went to the right, thinking that although his horse might be killed, he himself would remain alive and would in time get another horse. He rode one day, then a second day, then a third. Suddenly an enormous gray wolf came toward him and said: "Ah, so it's you, young lad, Prince Ivan! You saw the inscription on the pillar that said that your horse would be killed if you came this way. Why then have you come hither?" When he had said these words, he tore Prince Ivan's horse in twain and ran off to one side. Prince Ivan was sorely grieved for his horse; he shed bitter tears and then continued on foot. He walked a whole day and was utterly exhausted. He was about to sit down and rest for a while when all at once the gray wolf caught up with him and said: "I am sorry for you, Prince Ivan, because you are exhausted from walking; I am also sorry that I ate your good horse. Tell me why you have travelled so far, and where you are going"
"My father has sent me to ride through the world until I find the Firebird." "Why, you could have ridden even on your good horse for three years and never found the Firebird for only I know where it lives. I ate your horse, so now I will serve you faithfully and well. Get on my back and hold on tight." 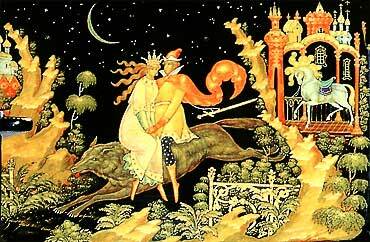 A.Lopatine "Prince Ivan and the Grey Wolf"
"Listen to me, and remember what I say. Climb over the wall and do not be afraid; all the guards are asleep. 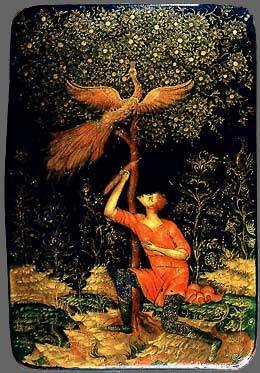 In the attic you will see a small window; in the window hangs a golden cage, and in that cage is the Firebird. Take the bird and hide it under your coat; but be sure not to touch the cage." "Who are you, and where are you from?" "I am Prince Ivan, the son of Tsar Berendey," Ivan replied. "How shameful! The son of a tsar coming here to steal!" the tsar exclaimed. "That is as may be," the prince retorted. "But your bird flew to our orchard and stole the golden apples." In that case you should have come to me and asked me for the Firebird and I would have given it to you out of respect for your father. But now I shall see to it that all the world knows of your behavior! And in order to earn my forgiveness you will have to enter my service. A certain Tsar Kusman has a horse with a golden mane. Bring that horse to me, and I will give you the Firebird and the cage." "I told you not to touch the cage. Why did you disobey me?" "I know I did wrong; but forgive me, grey wolf." "It is easy enough to ask forgiveness," the wolf answered. "All right, get on my back again. We will not turn back now." "Climb over the wall; do not be afraid, the guards are asleep. Go to the stable and bring out the horse. But be sure not to touch the bridle you will see hanging there." The prince climbed over the wall into the fortress, and saw that the guards were asleep. He went straight to the stable and found the horse with the golden mane. But his eyes fell on a bridle hanging up; it was of gold and studded with precious stones: the only bridle fit for a horse with a golden mane. And he put out his hand to take it. But at once the alarm was sounded all through the fortress; drums rolled and trumpets blared, the guards woke up, took the prince a prisoner and led him before Tsar Kusman. "Who are you, and where are you from ?" the tsar asked Ivan. "To attempt to steal a horse shows little wisdom! Even a peasant would not try to do that. But I will let you off, Prince Ivan, if you agree to enter my service. A certain tsar named Dalmat has a daughter, the beautiful Helen. Carry her off and bring her to me, and then I will give you the golden-maned horse and the golden bridle." "I told you not to touch the bridle. You did not obey my orders." "Nevertheless, forgive me, forgive me, grey wolf," the prince pleaded. "It is all very well, saying “forgive”. All right, get on my back." "I am not going to ser am going myself. You set of back to Tsar Afron; I will soon catch up." "Quick, get on my back, in case we are followed." "Why are you silent, Prince Ivan? Are you sad?" "Have I not good reason to be, grey wolf? How can I part with this beautiful princess? How can I exchange her for a horse?" "I will see to it that you are not parted from her," the wolf promised. "We will hide her somewhere, then I will turn myself into the beautiful Princess Helen, and you can lead me to the tsar." "Thank you, Prince Ivan, for getting me such a beautiful woman for my wife. Take the golden-maned horse and the bridle." The prince bridled the horse, mounted it, and rode off to the hut where the true Helen was hidden. He seated her behind him on the horse, and they rode away. "Why are you so thoughtful, prince?" "I have good reason to be. I am sad to think I have to give up the golden-maned horse in exchange for the Firebird." "You go and hide the horse and the princess. Then I will turn myself into the golden-maned horse and you can take me to Tsar Afron." So they hid Helen and the horse in the forest. 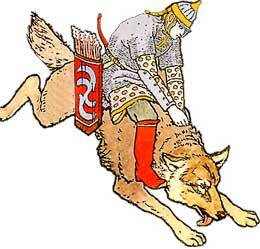 The grey wolf uttered a magic spell and became a golden-maned horse, and Ivan led the horse to the tsar. Tsar Afron was delighted, and gave him the Firebird and the golden cage as well. 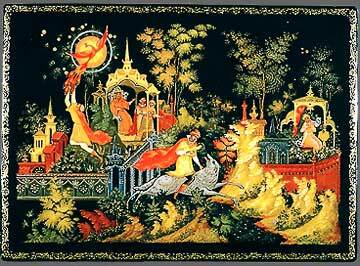 The prince carried the cage with the bird into the forest, seated the princess on the golden-maned horse, and rode off on his journey back to his native country. 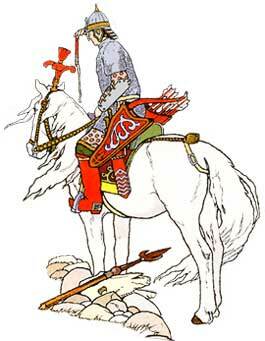 Meanwhile, Tsar Kusman gave the order for the golden-maned horse to be brought to him. But when he tried to mount it the horse turned into a grey wolf. The tsar was so frightened that he fell to the ground, while the grey wolf made good its escape and soon overtook Prince Ivan. "Now I must say goodbye; I cannot come any farther," it told the prince. "Do not bid goodbye forever to me. I shall yet be of service to you." "How can you be of any further service to me?" Ivan thought. "All my wishes have come true." He mounted the golden-maned horse and rode away with beautiful Helen and the Firebird. He arrived in his own country, but as he still had some way to go to reach home he decided to have a rest at midday. So they ate some food, drank water from a spring, and lay down to rest. No sooner had the prince fallen asleep than his brothers happened to ride past, and saw him. They had travelled far and wide in search of the Firebird, but of course they had not found it. When thev saw their brother lying asleep and noticed that he had the Firebird, the horse with its bridle, and even a beautiful girl, they plotted to kill their brother and take everything for themselves. "You must not say a word to anyone when we get home." Then they rode oft, with the horse, the princess, and the Firebird, to their father. They left Prince Ivan lying dead, with the crows already gathering above him. But suddenly the grey wolf ran up and caught one crow with its young chick. 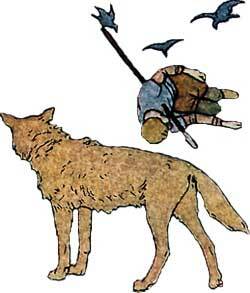 "Crow, you must fly away and bring back to me some sparkling water and some still water," the wolf told the crow. "If you bring back the two sorts of water I will let your young one go." The crow agreed, and flew off, while the wolf watched over the chick. In due time the crow flew back with both the sparkling and the still water. Then the wolf sprinkled Ivan's wounds with the still water, and the wounds healed; it sprinkled him with the sparkling water, and the prince revived. "I have had such a deep sleep," he yawned. "Yes, you were sleeping very soundly," the grey wolf said. "But for me you would never have awakened. Your own brothers killed you and carried off all you had gained. Now get on my back, quick!" The wolf raced off in pursuit of the two elder brothers, and soon caught up with them. It tore them to pieces and scattered them over the field. Prince Ivan bowed and thanked the grey wolf once more, and said goodbye to it forever. He mounted the golden-maned horse, and rode home with the princess. He had obtained the Firebird for his father, and beautiful Helen as a wife for himself. Tsar Berendey was delighted to see him with the Firebird, and asked him to tell of all his adventures. Prince Ivan told his father how the grey wolf had helped him to win the Firebird, the horse, and the beautiful Helen, how his brothers had killed him while he was asleep, and how the wolf had restored him to life and then torn them to pieces. The tsar mourned the loss of his two sons, but he was soon comforted, by the wedding of Prince Ivan and the beautiful Princess Helen, and they lived happily ever after. They left Prince Ivan lying dead, with the crows already gathering above him.